Since 2010, we have created a unique collaborative model amongst BC K-12 teachers who are trying to get the most out our students and our own professional development. Our approach to teaching and guiding focus centres on creating thinking classrooms that provide authentic connections between curriculum, identity, and place, primarily in the context of Social Studies. Read more about our long-term scheme, the TTSP project. ​​We believe that professional development should, as often as possible, involve something to do with fire, good food, strong conversation, and an inspiring location. There should be as much laughter as learning taking place, and while serious things should be discussed, no one is allowed to take themselves too seriously. Essentially, we have developed our Code for Pro-D along the lines of the Order of Good Cheer, the attempt by early French-Canadian settlers to survive the winter and "land-disease" through mutual contributions to the mind and body of companions. For others looking to replicate, imitate, or interrogate this model, start with the idea of authorship. Aim to be "people who are peceived as 'authoring' their own words, their own actions, their own lives, rather than playing a scripted role at great remove from their own hearts." (Parker Palmer, The Heart of a Teacher, ​https://biochem.wisc.edu/sites/default/files/labs/attie/publications/Heart_of_a_Teacher.pdf). Find a group of educators that you can get along with -- you don't have to be the same or think the same but you need to be able to laugh and work together. Find areas of common interest that might produce some inquiry -- a learning problem, an educational goal, a body of work that needs renewal. The more vaguely ambitious, the better. Don't shy away from subversive goals -- most educational problems are solved in the same cliched manner or a fabricated belief in "disruption" -- what is needed is some real creativity and divergent thinking. Look to the places and spaces around you, to traditional practices and aesthetics, for the wells from which you will draw. Find times and places to meet that allow you to really breathe, and are themselves a source of divergence, e.g. reclaiming professional development days. Build in time to eat, drink, play games, build a fire, and so on. These scenarios will allow the conversation to guide the agenda rather than the other way around. It follows, then that you shouldn't overplan the sessions; in tact, allow some confusion about who is in charge and what you are supposed to be doing. 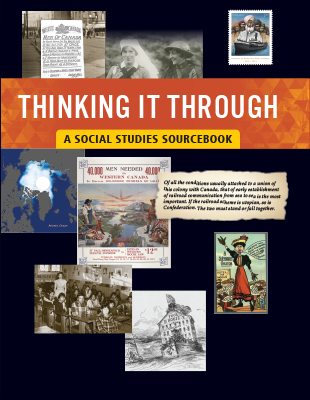 This Sourcebook, our latest (and only) publication, will help students develop their critical thinking skills as they explore selected topics from the revised BC Social Studies 9 Curriculum. Thinking it Through is organized according to CONTENT STANDARDS, each with four case studies in critical thinking: Revolution and Change, Imperialism and Colonialism, Migration and Shifting Population, Nationalism and Nation-Building, Regional and Global Conflict, Injustices and Rights, Land and People. We have selected primary and secondary sources, all kinds of questions, and suggested extension activities for 28 topics or case studies. Each one is a sandbox for teachers and students to explore CURRICULAR COMPETENCIES and apply historical (and geographic) thinking concepts. Students will push their thinking about what they can learn from evidence, and realize how the account changes depending on the evidence they use. Finally, by developing the ability to think through historical, social, or geographic evidence, students will learn how BIG IDEAS have shaped the past and the present. This resource began as a project of the Pacific Slope Consortium and has been published by Pearson Education Canada. Product link here. Rob Lewis, a consortium director, has put together a gainful site with resources for this new course, offered to many Grade 11 students in BC this year and set to become one of the core Grade 12 Social Studies electives in 2018-19. Follow the ongoing development of the course here. If for nothing but discussion purposes, check out this assessment scheme for Social Studies that embeds the competencies and opens news space for students feedback. Please let us know if you'd like us to have a look at an educational resource you've developed and for which you'd like feedback or help sharing. Link: A review & suggested gameplay by the Pacific Slope. This is a set of 50 cards that form a visual timeline. It can be used as a learning game, teaching resource, or assessment tool. It is produced by The Critical Thinking Consortium <https://tc2.ca>. We create and collect resources related to performance-based assessment, role-play/simulations, critical thinking activities, heritage projects, and working with primary sources. Please contact us if you would like to access or contribute to our Dropbox. If you would like to discuss a training session, professional development workshop, keynote presentations, or program evaluation, please contact us and we can go into more detail with you in person. The heart of our work relates to critical thinking in secondary Humanities and Social Studies classrooms, but we have some mad skills in other educational areas, too. What elements of design should guide us as we put the new BC Social Studies curriculum through its paces? What kind of frameworks can we use to make sense of the swirling mass of competencies, skills, and content? Is it that easy to pick and choose from among the (vast) content areas (now even vaster with the curriculum re-org) in order to address competence, or is SS more like Math in that there is some core content that is necessary for students to encounter in sequence? What's the difference between history and SS? What if we used a geographic framework to understand our role as SS teachers, or sociological or anthropological for that matter? Our recent discussions at Mumbleypeg 2015 included a look at the "curricular juggernaut" presented by the new BC Social Studies 9 as well as the relatively straightforward new BC Social Studies 8. Here is the New SS8 Curriculum at a Glance. Here is the New SS9 Curriculum at a Glance. A well designed and executed staff meeting results in affirmation of diverse and successful practices, needed change or solutions to challenges, improved morale, greater unity of purpose, a reduction of problems among staff and students, more confidence in achieving academic and social goals -- does that sound like a good start? A poorly designed staff meeting erodes all of these accomplishments, and leaves staff feeling bored, cynical, reluctant, frustrated, or upset. We've all been there and got that t-shirt. A successful staff meeting has positive reverberations for students, sending teachers, administration, and support staff back into the halls with energy and resolve for improving the learning experiences of students. While it takes a whole staff to “win or lose” a staff meeting, there is a strong role for the administrative team who sees the meeting as their chance to make an impact and craft a memorable learning event for others. It is no coincidence that this is the same approach that a successful teacher takes in designing a lesson for students. Check out a sample tool for assessing intention and design process in staff meetings.